comforting growth of attention towards this theme, which is also rich in implications with the field of marketing. And with a growth in sensitivity to the topic also the sustainability standards are growing: in many fields such as the constructions and the industrial design there are norms and tailored solutions to allow the houses to consume less energy and to create object using less environmental pressure. On the other hand, in the world of events we don’t do much more than using recyclable dishes and glasses or eating biological canapés. To be truthful, the problem of the events’ sustainability is constituted by the temporary structures (ie. scene settings, stands, refreshment points, advertising installations, etc.) that require large quantities of materials and processes and are seldom sustainable, as any analysis may confirm you. At best the most eager companies use certified materials and furnishing, trying to unravel in the forest of the ecological certifications. 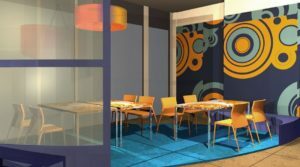 And what they obtain, at best, is to be provided with materials and furniture which are variously certified but – probably – they still won’t have a truly sustainable set up. Why? First of all because the certifications (that nowadays in this field are still voluntary and not codified by law) grant an object or a material for its characteristics and for how it was produces, but not for its subsequent use. Secondly, and this is the main problem, for how complex it is to evaluate the sustainability of a product-set up. In fact, we are talking about a check on the sustainability of the whole process (from the production, to the use and disassembly of the set up) and this analysis considers infinite factors. How to evaluate a green set up? An example can help us to be more clear. Let’s suppose we designed a structure with 20 timber frames, 300 chairs, 10 plasma screens. The frames have a PEFC mark, meaning they were built with wood from ecologically managed forests. The chairs have an Eco LABEL certification: this means they are not made with substances containing lead and at least the 15% of their upholstery is recycled material. The plasma screen have a tag of energetic class A++. 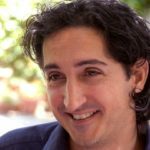 Of course this materials are at the basis of a sustainable project, but there are at least 3 other fundamental issues before being able to state that the whole structure is sustainable: 1) the use of materials, their disassembly and their disposal (what is it going to be of the PEFC frames? will they be used again? will they be disposed of? in which quantity?). 2) the energy consumption for the construction (cut, paste, colour the timber frames: was the equipment used efficient? ), for the assembly/disassembly and for the use (were the screens turned on just for the time that was strictly necessary). 3) lastly the quantity of emissions produced by logistics and transportations (I rented certified chairs but they had to be transported for 200 km by a heavy-goods vehicle… ). As you can see there are many elements and it’s hard to consider them all at the same time. The official norms aren’t particularly exhaustive in this field, but some institutions are voluntarily taking action both to ask more elevated ecological sustainability standards and to offer methods and procedures to obtain them. 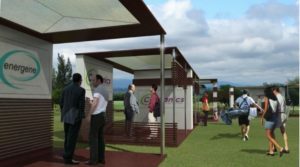 Thus acted Regione Toscana (the regional administration for Tuscany), which developed, in partnership with the Master degree in Design from Florence University, a method that can help the customer, the designer and the realizer of the temporary structure. The method is made up of a series of instruments for the control of the environmental weight and of criteria that are to be followed from the design phases. The method uses a reasoned cataloguing of the certified materials and components that are available on the market and specifications that define and control the technical and environmental performances for every single element of the structure. Essentially it allows to set the environmental goals to try to achieve and to measure, from the design, the quantity of energy and materials that the structure will require and the emission that it will produce during all of the phases of its “life”, meaning realization (including assembly and disassembly), use and discharge (reutilization and/or disposal). Let’s apply the method to our example! We need to check the certified materials according to our need for the project. We check if the elements, for example the frames – of different heights and dimensions – follow the rules and best practice for the reduction of material consumption: reduced thickness, reversible coupling systems, choice of productive processes that minimize scraps and waste. It is necessary to plan, together with the design of the structure, its reutilization or the disposal of the waste. The plasma screen will be connected to disposals that would automatically turn them off in absence of people. The closer rental service will be chosen for the chairs. All of the design choice and the production is thus checked is every step of the process. The method defines three eco-classes (A-B-C), each corresponding to a level of energetic consumption, of emission and of consumption-reutilization-disposal of materials. 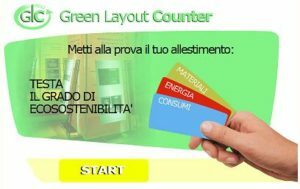 This method, to the creation of which I collaborated and that we called “Green Layout”, it’s an easy and practical guide that offers objective and measurable results in quantities of kWh, CO2 and materials. The companies that will use it will be able to demonstrate the effectiveness of their green behaviour, making their marketing communication more effective and, in some cases, managing to cut the costs as well!